Hotels Worldwide, part of Marriott International in partnership with Coca-Cola, has unveiled the latest W Sound Suite at W Hollywood. The private music studio and writers room offers hotel guests and musicians alike the opportunity to experience recording like a pro in the heart of global music capital, Los Angeles. The W Sound Suite at W Hollywood follows the opening of the world’s first W Sound Suite last year located at W Bali. In April, the first W Sound Suite in North America opened at W Seattle, and later this month the fourth W Sound Suite will be unveiled at W Barcelona. W Sound Suites are in part the brainchild of the brand’s North American Music Director, DJ White Shadow – the Chicago-based producer best known for his work with Lady Gaga. Under DJ White Shadow’s guidance, each suite has been custom-fitted with professional grade sound equipment from top tech companies in sound production. Under his direction, the W Sound Suite has been outfitted to professional specifications in a stylish, comfortable and soundproof space that includes the latest equipment from prominent industry leaders on sound technology. W Hotels and Coca-Cola partnered with Native Instruments and Shure to outfit the W Sound Suite with state-of-the-art equipment including control keyboard, all-in-one DJ system, and professional grade headphones, and microphones. The W Sound Suite will also provide a Yamaha acoustic guitar and Fender jaguar bass for guests and artists to use during their sessions. The W Sound Suite also features murals from visual artist Bisco Smith, highlighting Coca-Cola’s iconic lyric, “I’d like to teach the world to sing.” For over a century, Coca-Cola has used music to tell the brand’s story, establishing campaigns as part of the pop culture lexicon. The partnership is a perfect match for both brands, both dedicated to fueling music for guests and artists across the world. 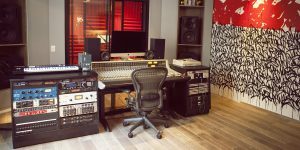 For the latest sounds to come out of W Sound Suite or to book a session, visit www.whollywoodhotel.com/wsoundsuite. Join the conversation with @WHollywoodHotel and #WMUSIC.